Henry Hall was privately educated until his father died in 1828. For some nine years he worked for a Dublin firm of builders and government contracters, and during that time acquired a good knowledge of mathematics and other technical subjects. In 1839 he entered government service as a works foreman in the Royal Engineers Department, and three years later was transferred to the Cape Colony to be stationed on the eastern frontier. He supervised the construction of the first signal tower to be erected in South Africa and the erection of barricades along the Fish and Kat Rivers. Here he tested and put into operation a telegraph system designed by Lieutenant-Colonel G.G. Lewis. In 1845 he was promoted to clerk of works, fourth class, working at Fort Beaufort and Grahamstown, and was involved in some phases of the Frontier Wars in 1846 and 1851-1852. He returned to England for health reasons and worked for the inspector-general of fortifications for some time, but in 1853 was sent back to his earlier post at the Cape at his own request. In October 1857 he became a member of the Literary, Scientific and Medical Society, Grahamstown. 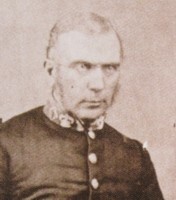 The next year he was promoted to clerk of works, first class, in charge of the Royal Engineer Department in Cape Town, but was recalled to England in June 1860 and became a clerk in the office of the Colonial Secretary. Hall made several contributions to geographical knowledge about the Cape and particularly to its cartography. His first published map, Cape of Good Hope: Map of the Eastern Frontier of the Cape Colony... (London, 1856), received wide recognition. It was based on military and other surveys and was a marked improvement on earlier maps of the region, particularly because it contained new information on the area east of the Fish River. However, Thomas Maclear* pointed out in a report to parliament that, like all previous maps, it suffered from the lack of accurately determined longitudes. Hall's map-making activities started years before his map of the Eastern Cape was published. In 1851 he completed a manuscript map of southern Africa south of latitude 25 degrees for the Board of Ordnance, which seems not to have been published. It depicted the country from its southern extremity to the Magalliesberg in the north on a scale of "about 10 miles to half an inch" (c. 1:1 267 000). It included details of Maclear's arc of meridian survey in the western Cape, and was described with much praise in the South African Commercial Advertiser (6 September 1851). In 1852 he received one hundred pounds sterling from the government of the Cape Colony for his work on this map. Hall took a copy of his map to London in 1852 for publication by Arrowsmith, but after lengthy delays, probably as a result of his numerous additions, it was eventually engraved and printed in Cape Town in 1857, titled Map of South Africa to 16 degrees South. The list of individuals who provided information for it indicates that it was based on the map that he took to London five years earlier. This was the first map of any consequence printed in South Africa and was based on all available information in the offices of the surveyor-general and Royal Engineers, as well as contributions by numerous individuals. Of interest are the place names Pretoria and Witte-Waters-Rand, probably included in this map for the first time. The routes of the Limpopo and Olifants Rivers from the Transvaal to the Indian Ocean were not yet traced, while the exact positions of some geographical features in the Free State and Transvaal were still uncertain. Much of the information for the northern region was obtained from the missionary Robert Moffat senior. Hall also contributed to the compilation of some other maps of parts of the Cape Colony.While engaged in map-making he gathered information relating to various other aspects of the geography of the colony. This lead to the publication of his first significant paper, "Geographical notes on South Africa", in the Eastern Province Monthly Magazine (1856-1857, Vol. 1, pp. 131-137, 190-194, 264-268). The first two parts described the colony's coast line, bays, harbours, and navigable rivers, while the third part dealt with its physical features. In 1858 he suggested to the Cape government that a trochometer should be fixed to the wheel of the postcarts. That same year he published a paper on "Modern geographical nomenclature, from a colonial point of view" in the Cape Monthly Magazine (Vol. 3, pp. 359-368). However, his main contribution to local geography was his Manual of South African geography (Cape Town, 1859), the first such work to be compiled locally. The compilation was undertaken at the request of the colonial secretary, Rawson W. Rawson*, to provide a much needed textbook for use in high schools and by candidates for the civil service. The book included a general description of southern Africa and a section on its physical geography, with tables of climatological data. A Dutch translation was published in 1860, and a second edition in 1866. Later he wrote Southern Africa, including the Cape Colony, Natal and the Dutch Republics (1876), aimed mainly at engineers and builders. The next year saw the publication of J. Thomas Baines's* posthumous work, The gold regions of south-eastern Africa, for which Hall acted as supervising editor. Hall was a Fellow of the Royal Geographical Society. He also published some articles on natural history and other topics of general interest, including a chapter on natural history in the Handbook to South Africa... (1872) of S.W. Silver and Co. Other contributions were published in the Cape Monthly Magazine, for example "Notes on animal life in South Africa" (1857), "A sketch of Basutoland" (1858), "On telegraphic communications" (1859), "Notes on the properties of fountains; chiefly from the old naturalists" (1876), and many more. In 1875 he returned to the Cape for a brief visit during which he spent some time at Port Elizabeth and published "Cape Town revisited" in the same journal. His interests extended to various other aspects of culture. For example, he translated several French and German articles for publication in Cape literary journals, and was actively interested in art and music. His many friends included Baines, and the explorers James Chapman*, and Frederick Green*. Hall was married to Sarah Ann Maria Welch, but in 1882 the marriage was falling apart. Cape Monthly Magazine, 1857, Vol. 1, papers by Hall. Eastern Province Monthly Magazine, 1856-1857, Vol. 1, papers by Hall. Grahamstown Journal, 13 October 1857, p. 2: Literary, Scientific and Medical Society. Henry Hall [obituary]. Cape Quarterly Review, 1882, Vol. 1(4), pp. 714-716. National Automated Archival Information Retrieval System (NAAIRS). http://www.national.archives.gov.za/naairs.htm Documents relating to Henry Hall / H. Hall. Our portrait gallery. No. xviii. Henry Hall Esq., R.E.D. Cape Monthly Magazine, 1860, Vol. 8, pp. 124-127. Rochlin, S.A. Henry Hall: Pioneer South African cartographer and litterateur. Africana Notes and News, 1961, Vol. 14, pp. 251-265. South African Commercial Advertiser, 6 September 1851, p. 3: Geography of South Africa.